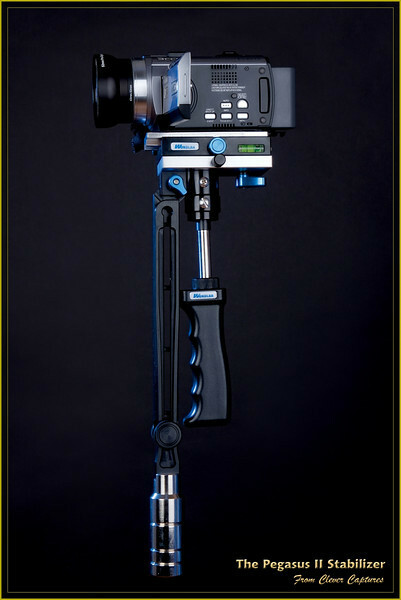 The beautifully engineered Pegasus II video camera stabilizer. To see full size images, click on any image and then select "O" from the sizes stated at the top of the next screen. We are pleased to be appointed as Official Retailer of US Wondlan International Limited products for both professional and amateur videographers. We have selected their products due to the very high quality and precision in both the manufacturing of the products and in their use. Here you will find information on the Pegasus II camera stabilizer – very fast to set up, obtaining smooth-as-silk video and being certainly the most beautifully engineered and attractive concept of stabilization available! Please note that none of the cameras shown in these images are included. 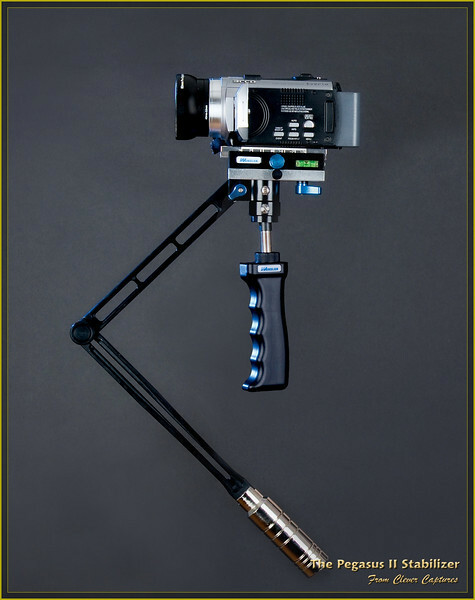 The Pegasus II, shown here with balance bracket folded in executive black finish with a camcorder mounted, is a professional and amateur users, hand held, video camera stabilizer. It has been designed essentially to meet the needs of amateur and domestic film and video makers. However, with high quality HD cameras reducing in size and weight, such as the recently released GoPro HD Hero2 (also being sold by Clever Captures at http://www.gopro.ph) it is also suitable for professionals in the movie, television, wedding and advertising industries. Note! Advise regarding the use of this product with the GoPro Hero2 camera will be released shortly. 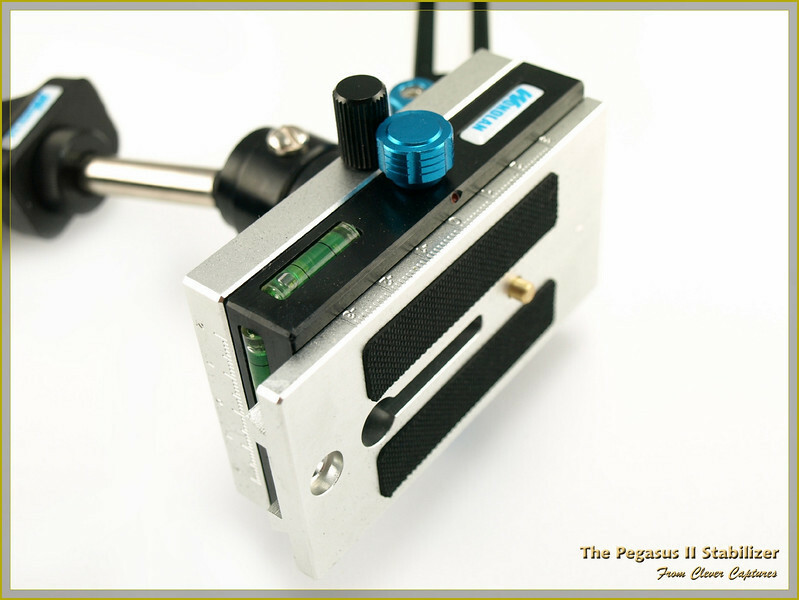 The Pegasus II is lightweight, compact, easy to set up, easy to adjust and easy to control. It incorporates lightweight, aviation grade aluminium components with a self weight of only 0.7kg making this one of the lightest small camera stabilizers in the world. This greatly eases the physical workload and enables professional film and video makers to shoot steadily for long periods of time. The stabilizer incorporates a dual-link design, enhancing the stability and allowing the lower section of the crank arm to fold into the upper section. It is fixed with a locking screw at the connection between the platform and the upper section. The Pegasus II stabilizer is produced on an internationally advanced CNC production line incorporating a surface treatment process of international advanced precision aviation specifications. The system incorporates a high-strength alloy spring. The Pegasus II unique patented hand-held shock absorption and balance design greatly absorbs vibration generated during shooting. Combined with the fine adjustment system of the bi-directional platform, shooting is enjoyed with maximum stability when using super-light and medium weight video cameras. This is provided with high-grade chrome-plated weights. These are supplied in different weights to provide a wide scope of application. They can be individually added or removed very quickly to provide very fine adjustment during set-up or when disassembling the stabilizer. 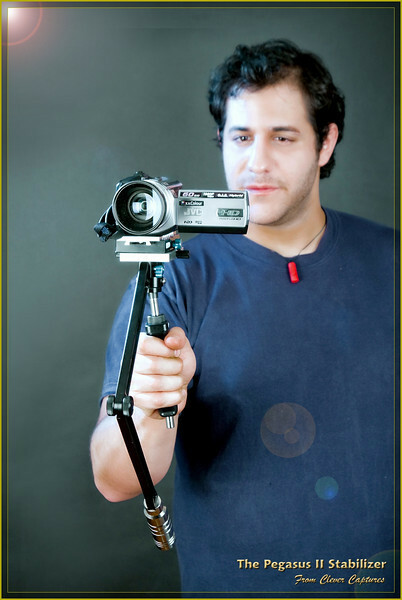 The Pegasus II stabilizer allows film and video professionals and camcorder enthusiasts who, without a stabilizer, are unable to realize their dream of shooting professional looking movies. The low cost allows all videographers to own this necessary equipment which compares with those used by Hollywood movie shooting masters. Fine adjustment bi-directional camera platform mounting plate. Anti-skid damping pad. Pro camera and camcorder fixing screws. Telescopic locating pin. Camera platform. Platform base. Platform bracket. Forward/Rear fine adjustment knob. Forward/Rear locking screw. Left/Right fine adjusting knob. Left/Right locking screw. The unique design allows this to be the stabilizer with the quickest adjustment in balance and the most convenient in use of the world. Universal dynamic self-balance system. Gimbal technology is widely used in aerospace, aviation, cars, trains, ships, large machinery industries, etc. Skilful design allows this highly sophisticated industrial technology to be used in the professional film and video equipment industry. This incorporates lightweight aviation grade aluminium; The dual-link V-shaped crank arm with central void greatly reduces swing caused by wind pressure. With precise calculations, testing and experimenting, it has been proven that this crank arm design achieves precision dynamic balance easily with quick and simple adjustment, greatly simplifying set-up and adjustment of the stabilizer. 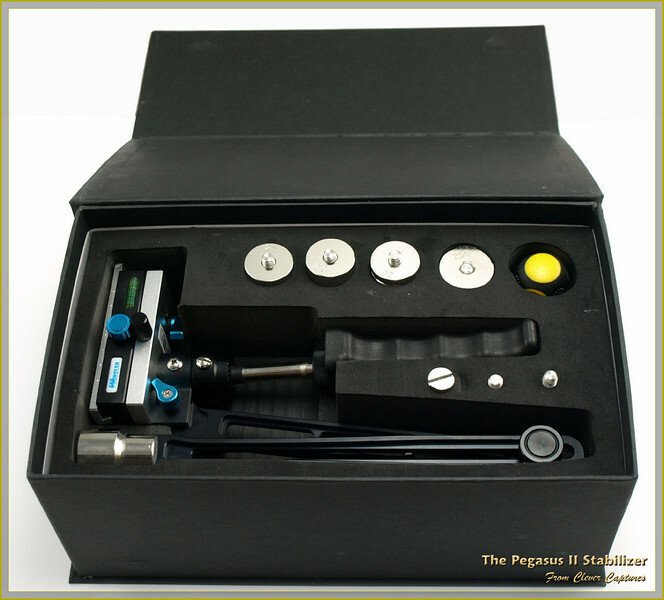 The Pegasus II stabilizer is designed by American top grade film and video equipment designers. The dual-link V-shaped lightweight crank arm is the result of research, precise calculations, repeat testing and experiment. The professional universal dynamic self-balance system with damping handle, that significantly absorbs camera shake, allows excellent control of the Pegasus II stabilizer regardless of the user being a professional or amateur. Balance adjustment is a necessary and very important process before using any stabilizer. The adjustment directly affects shooting and control of the camera which directly affects the quality of the film/video recording. The set up time is minimal due to the easy and fine adjustment mechanisms incorporated into the stabilizer which incorporates a bi-directional platform below the camera fixing plate. In just a few minutes, the stabilizer can be configured, balanced and ready to use. The platform system of the Pegasus II stabilizer is designed for a wide range of domestic and amateur lightweight video cameras. The Pegasus II platform system has rotating knobs to precisely adjust the centre of gravity of the camera forwards and backwards and side to side. This system offers very fine adjustment greatly improving the function of the Pegasus II stabilizer and allowing it to support a wider range of cameras. The unique and simple adjustment method allows you to adjust the balance in 2-3 minutes with high precision. Fine adjustment system of bi-directional platform has precise scale, as long as you record the settings. Using the same settings again, the Pegasus II stabilizer will automatically balance with no set-up time at all. The unique design allows the Pegasus II stabilizer to be the first stabilizer in the world that does not require balance adjustment. The Pegasus II stabilizer is light in weight and steady in performance with a high tech design. The full aluminium alloy body is only 0.7kg; it is one of the lightest stabilizers in the world. Equipped with a lightweight video camera, it is possible to shoot smoothly for long periods of time which not only reduces the physical stress on videographers but also improves the shooting effect. The Professional “universal dynamic self-balance system” and the “handheld damping system” allow the Pegasus II stabilizer to achieve smooth shots of a professional standard whilst shooting under normal conditions, whilst running or whilst on uneven terrain or stairways.